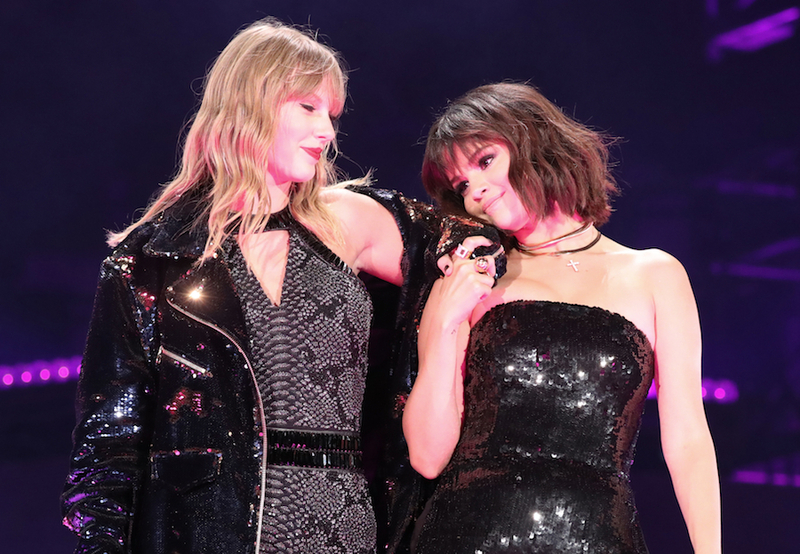 5 Artists We Want To See Taylor Swift Duet With During Her 'Reputation' Tour! I’m not sure I’ll ever forgive myself for not attending Taylor Swift’s recent Reputation concert at the Rose Bowl in L.A., as her first of two performances at the famous arena featured a guest appearance by Shawn Mendes, while the following night had Selena Gomez, and Troye Sivan gracing the stage. Past-Caroline, I’m disappointed in you. If you are in the audience during one of Taylor’s tour dates, though, it seems like every night is a star-studded affair. When you have two successful pop stars like Camila Cabello and Charli XCX on tour with you, every night of the Reputation tour is an epic opportunity too see multiple performers alongside Taylor. And yes, many of those aforementioned famous names are a part of Taylor’s "squad", but she isn’t opposed to welcoming new people into her circle. With that being said, here are some people we would LOVE to see Taylor bring out on her stage! After Kelly’s recent rendition of Taylor’s "Look What You Made Me Do" in her opening sequence as host at the Billboard Music Awards, we could absolutely see Taylor inviting Kelly to make a pit stop on her tour. Kelly has made the transition from pop to country over the past few years, while Taylor has done the exact opposite. This overlap in musical genres would make for an excellent performance. But that isn’t the only overlap these two powerhouses share. Both Kelly and Taylor are role models for young women and have shared messages of female empowerment! We could see Taylor and Kelly singing Kelly’s hit "A Whole Lotta Woman" or "Stronger (What Doesn’t Kill You)". Taylor shared a cute instagram of her and the BTS boys at the Billboard Music Awards, saying “So great meeting you!! You’re killing it! !” Okay, so an alliance between these boys and Tay is brewing. I can feel it. I can already see it now -- some form of dance sequence between the boys and Tay which makes the crowd lose their minds. I wonder what song they would perform! Any ideas? Cardi has BLOWN UP in the two years Taylor has seemingly been on hiatus from the music world, and the rest of the planet, for that matter. Both women have a lot of new content out, releasing albums around the same time. Competition can be turned into creativity for these two women, though, as Taylor has been known to show her abilities to rap. While I can definitely envision some type of collaboration between these two ladies, it may be difficult, as Cardi B is about to give birth and get married. A known pal to frontman Adam Levine, an invitation from Taylor for Maroon 5 to appear on the Reputation tour seems inevitable… and one that will surely be accepted in the near future. To be frank, I’m surprised Maroon 5 hasn’t popped up at one of Taylor’s previous concerts, as she has invited several bands to be guests at one of her shows. Her friendship with Adam is known -- as she is also friendly with his wife Behati Prinsloo. She even guest-mentored on Adam’s show, "The Voice". In concert, Maroon 5 has been known to cover Taylor’s "Mine", so what is the hold up, people? We want this to happen! Another pal of Taylor’s, Kesha seems like a natural choice to invite on stage. Kesha has been open about how Taylor has supported her throughout her legal trial, and has even alluded in the past that the two are making music together. We are ready whenever you are, ladies! Similar to Kelly Clarkson, Kesha has some beautiful female empowerment ballads that we know she and Taylor could deliver to a crowd. Just putting these suggestions out in the universe… If Taylor happens to see them and acts on them, then hey, what a lovely surprise for all of her concert-goers! From what I’ve heard (yes, still bitter), the Reputation tour is fantastic, but these added performances would just be an additional bonus to seeing the phenomenal Tay live in concert.